Okay, so no, it's no secret that me and Spud are huge Disney fans, why would we even want to keep that secret!? Disney is fantastic, and so is Spin Master because they have brought out Disney Hedbanz, a Disney version of the Hedbanz game we reviewed here. I thought now was the perfect time to publish this review because one week away today, 7 days away exactly (12th July) Disney Pixar Monsters University is hitting cinema's nationwide!! Are you all excited!? 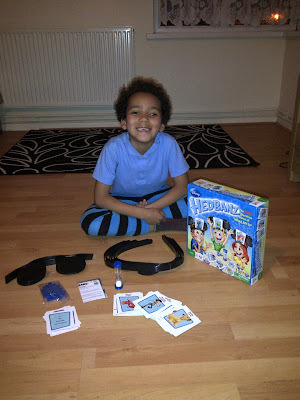 Me and Spud are getting more and more anxious each day, to keep us in the lovely Disney spirit we have been playing the fabulous game we was sent month's ago on a daily basis to keep ourselves entertained until our next Disney movie fix! 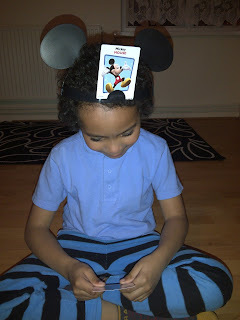 To play Disney Hedbanz, hand each player (in our case just me and Spud) a question card, 3 Mickey Mouse chips and shuffle the deck of character cards. 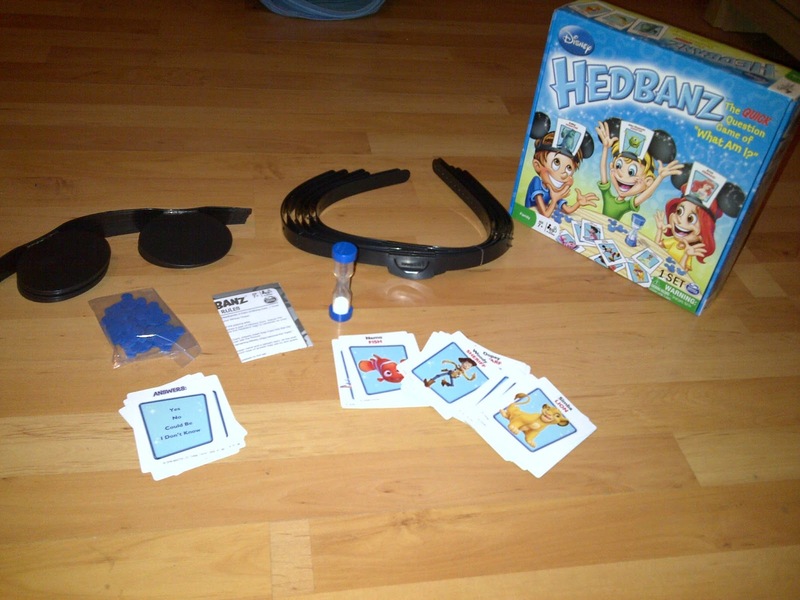 Place the cards face down and deal each player a card face down so the, the player then has to place the card onto their Hedbanz for the rest of the game players to see without looking at the card themselves. Players take it in turns to ask questions (the game comes with suggested questions printed on cards, or you can ask your own) to guess who they are. However, other team players can only answer with selected answers which is; yes, no, could be or I don't know. For example, Spud could ask am I a girl? I would answer Spud with a no, Spud could then say am I a boy? I would reply with a yes. Spud could then ask if he is a goody? I would answer Spud with a yes (going by Mickey Mouse on his Hedbanz). Spud can take as many guesses to who he is in the minute that the timer runs for. If Spud should guess who he is correctly before the sand in the timer runs out, he would place one of his Mickey Mouse chips into the middle. 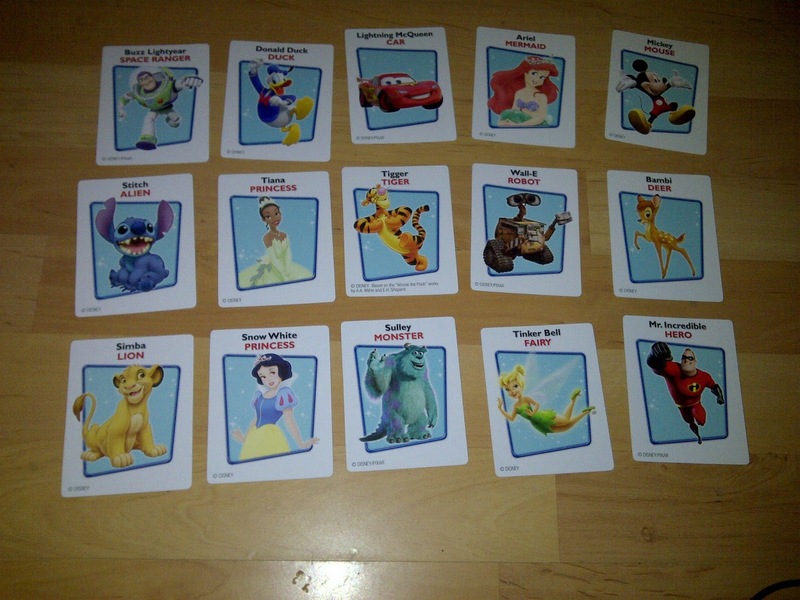 The aim of the game is to be the first player to lose all 3 of your Mickey Mouse chips, so in other words, be the first player to guess who you are correctly within the time limit 3 times. 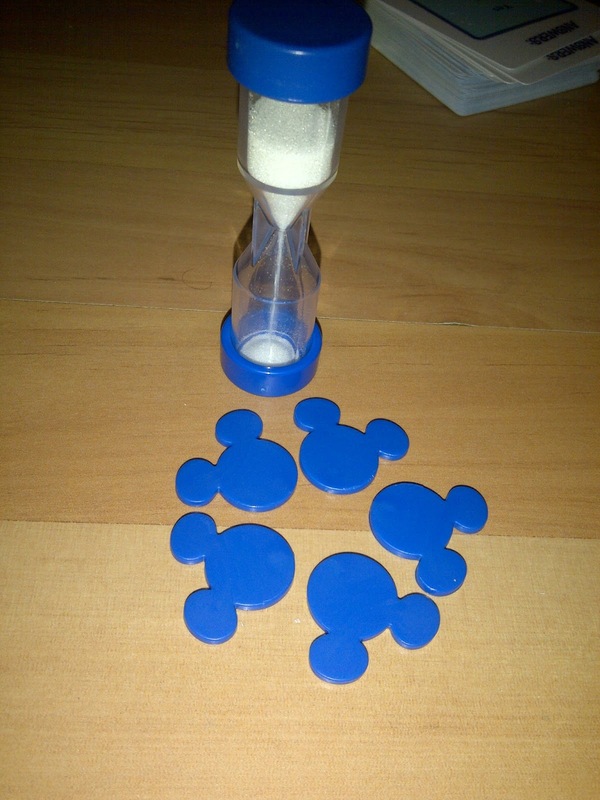 If you do not guess correctly before the timer runs out then the player has to collect another Mickey Mouse chip. 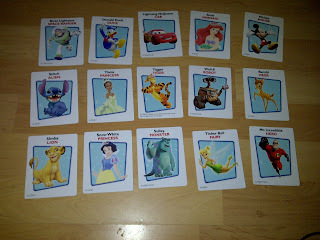 Each card has two different answers, for example, Mickey is his character name, but he is a mouse, WALL-e is his character name but he is a robot, and Sulley is his character name but he is a monster! So the player could guess the character name, or guess their card by the generic term. We love the game, not because we are hugely biased Disney fans but because we find Disney Hedbanz very enjoyable and entertaining. 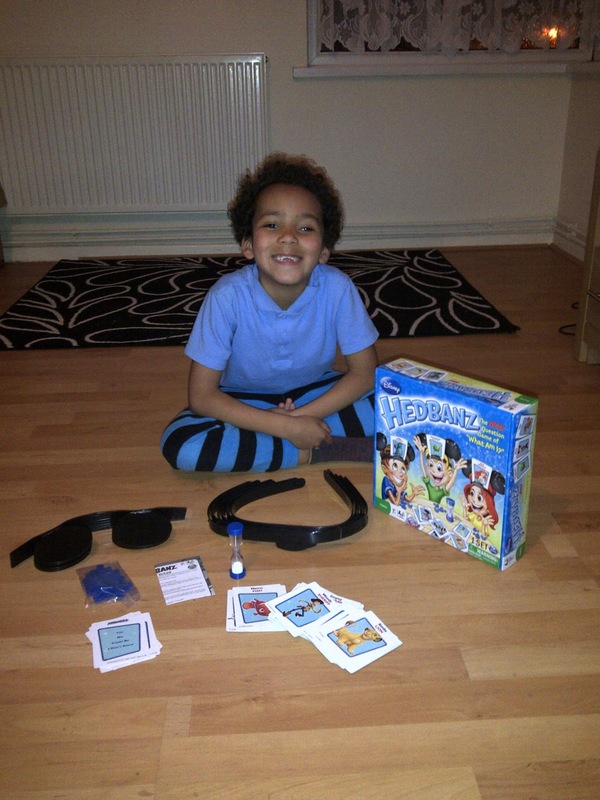 As a parent, I love that I could let Spud play happily with friends without needing constant help, the set up (if you could call it that) was very easy, the colours and fonts are bright and bold and very appealing to not only children but adults too. 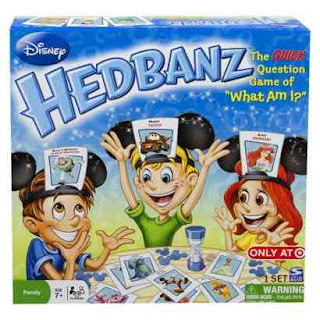 Disney Hedbanz is available to buy with a suggested RRP of £14.99 and is available to buy from Debenhams, Smyths, Amazon and smaller independent toy stores. To find out more about Spin Master check out the official website here. Wilko Fun Summer Garden Products For The Kids! You Don't Care, Your Never There..